In celebration of the summer season, we ventured to the farmers market to collect the colorful remnants of warm weather. We got the last few bright red and yellow tomatoes on the farmers table. The pick of brussels sprouts was plentiful, probably because they are often overlooked and under-appreciated in my opinion. This recipe is based on one of my favorite recipes my mother makes. You can add fresh grated parmesan or mozzarella on top, but this dish is so fresh, simple and delicious that it doesn’t even need it. 1. Preheat oven to 400 degrees. Toss brussels sprouts in 2 tsp olive oil, salt and pepper. Place in 1 layer on a baking sheet. When oven reaches temperature, bake for 20-25 minutes, flipping halfway through. 2. Placed chopped tomatoes, olives, 2 Tbsp olive oil, basil and oregano in a large mixing bowl. Add salt and pepper, to taste. Toss, set aside and stir once in a while. The longer this sits, the more the flavors will meld. 3. 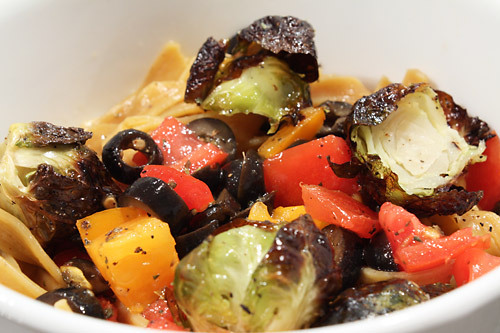 When the brussels are done, toss them into the tomato mixture and place over pasta. It all looks real scrummy but I think a new PB review is long overdue! You’re right! I will try to get one of those up next! My kind of pasta sauce!!!! Always appreciate your dedication to all things PB but also love the occasional posts concerning the farmer’s market items, especially a recipe as colorful and simple as this one! Sweet potato pasta…? I’ll have to try and hunt some of that down!!! This looks amazing!!! Thanks Debbie! We love farmer’s markets and try to buy from them as often as we can. Nothing beats some fresh cooked local veggies – the difference in taste is astounding! Nick that’s was so cute. That sounded so cute too…LOL. But What are you saying there!? Thanks Debbie!? Say what? But you recipe looks so good.